Some say that Plato was the one who came up with the well-known and often-used proverb that states necessity is the mother of invention. That’s a distinct possibility, but I’m not so sure it wasn’t an imaginative cook who coined that phrase. The reason I say that is that some of my favorite recipes are ones that were invented because of the need to make use of ingredients whose optimal quality of edibility was nearing. The following recipe is one such example. We had a tremendous tomato crop this summer, so when the time came to pick the remainder of them before a killing frost, we were left with a couple of bushels of my favorite vegetable in various stages of ripeness. 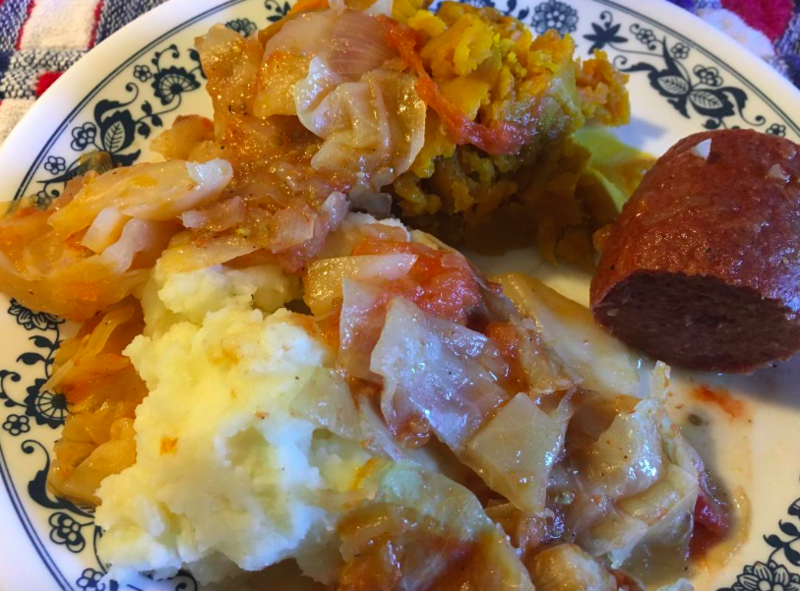 I came up with the following recipe, which contains a ring of all-beef bologna and about 2 pounds of home-grown tomatoes as well as cabbage and onions from our garden. The result was a dish that drove my taste buds wild because of the multitude flavors. It’s a dish that would be fit for a king or a Greek philosopher for that matter. Place cabbage, sauerkraut (if using), onions, garlic and tomatoes in a Dutch oven. Add salt, pepper and sugar. Mix well. Place bologna on top and place in preheated 350-degree oven. Bake for about 2 hours. Serve with mashed potatoes and baked buttercup squash. TOM DAVIES: The Verdict — Interrogation Gone Wrong?